Vernier calipers are the most reliable measuring tools compared to dial calipers and digital calipers. Unlike dial calipers and digital calipers, Vernier calipers can be exposed to coolant, oil, water and dust without worrying about damaging any internal working parts. But it will definitely test your eyesight to read the vernier. The upper scale reads in inches. Each bar graduation on the main scale is .025”. Every 8th graduation (.200”) is numbered . Each graduation on the vernier scale is 0.001”. Every 5th graduation (.005) is numbered. For the correct reading, in the picture below, the measurement of .839 is determined by reading .825” on the main scale (.800 + 1 bar (1x.025=.025) =.825” ). Then add .014 as determined by the reading of the vernier. The graduation on the vernier that best lines up with the graduation on the main scale is the correct reading. The lower scale reads in metric. Each bar graduation on the main scale is 1mm. Every 10th graduation is numbered (1 cm = 10 mm) . Each vernier graduation is 0.02mm. Every 5th graduation (.1mm) is numbered. 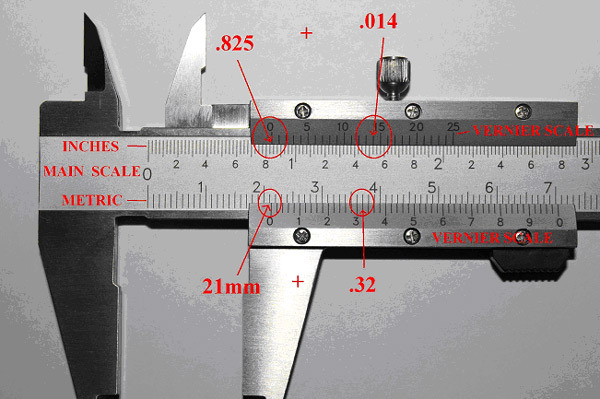 In the above example, the measurement of 21.32 millimeters is determined by reading 2.1cm (21mm) on the main scale, and then adding 0.32mm as determined by the vernier. Again, the graduation on the vernier that best lines up with the graduation on the main scale is the correct reading.